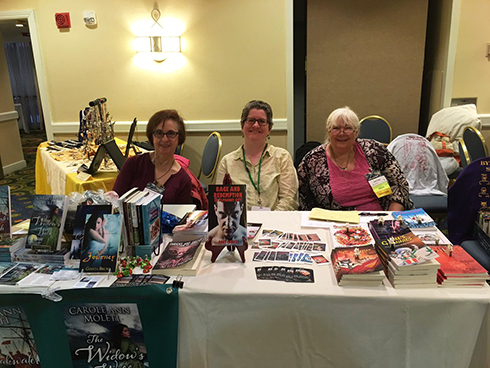 I had an amazing time at Lunacon, where I shared a table with April Grey and Carole Ann Moleti! I sold a few copies of my books, Rage and Redemption in Alphabet City to a sixteen-year-old girl--corrupting young minds! I only got to check out one panel, a tribute to Carrie Fisher. I didn't have a chance to break for lunch until 2:00 p.m. at which point the hotel restaurant had stopped serving lunch. Uh, why?? They only had appetizers, I had the pork belly, which was tasty, but not filling enough, so I ordered a side of fries. The HWA was out in full force! Marc Abbott, James Chambers, Elizabeth Crowens, elfman, April Grey, Steven Van Patten, and several others were there! I'll be back next year!